Barn Night, presented by Dover Saddlery, is back with great contests and prizes, Gambler's Choice costume class, mutton busting and lots more! Sign up your barn now. August 30, 2012 – The Washington International Horse Show is pleased to announce “What’s Your Dream?” as the theme for this year’s Barn Night. Barn Night, presented by Dover Saddlery, will be featured on Thursday, October 25, during the 54th annual WIHS. The competition will be held on October 23-28, 2012, at Verizon Center in downtown Washington, D.C.
Barn Night at WIHS is a favorite with local young riders and horse enthusiasts who attend in groups and have a chance to enter contests, win big prizes, and enjoy a fun, horse-filled evening. Join us on Thursday, October 25 at 6:00 p.m. for activities on the concourse, including a Stablemates painting activity hosted by Breyer Animal Creations. The first 100 kids to arrive will receive a special prize, also courtesy of Breyer. Enjoy the evening’s entertainment: Jumper competition, including the exciting and hilarious Gambler's Choice Costume Class, the Mutton Busting exhibition, a t-shirt toss, plus an autograph session with top riders! The famous Puissance wall will also be on the concourse for photos ops. Register your barn now to be eligible to participate in fun group contests and for the chance to win great prizes! See Barn Night Contest Rules for details about the 2012 WIHS Barn Night Contests: Largest Group (Overall, MD, VA and DC/Other), Best Group Spirit, Best Group Banner, and Best Group Video. Barn Night is an opportunity for the regions’ horse lovers to come together and enjoy a night of entertainment and camaraderie. One farm that has been a great presence at Barn Night each year is Cedar Creek Farm. Mary Elizabeth Cordia is a 14-year-old rider from Alexandria, VA, who has attended Barn Night as part of the Cedar Creek crew for the last four years. Cordia started riding when she was seven and trains with Jenny Graham at Cedar Creek. Cordia’s mother, Liz, also gets involved with Barn Night as a volunteer. Cordia loves the upbeat atmosphere of Barn Night and enjoys the time with her fellow riders and their families. Lots of great prizes will be awarded to this year’s contest winners. For the Largest Group (Overall, Maryland, Virginia and DC/Other), a $1,000 cash prize will be provided, courtesy of Gaithersburg Equipment Company. The three individual largest groups (Maryland, Virginia, and Other States/DC) will receive prizes from Dover Saddlery (each valued at $750). The Group Banner Contest will feature the “What’s Your Dream?” theme. Prizes will include gift certificates from Dover Saddlery, which will be awarded for Champion ($500 value), Reserve Champion ($250 value) and three Honorable Mentions ($50 value each). In the Group Video Contest, prizes will include gift certificates from Dover Saddlery awarded for Champion ($500 value), Reserve Champion ($250 value) and three Honorable Mentions ($50 value each). For Best Group Spirit, the Champion group will receive a clinic for their barn from a nationally known trainer, to be announced soon. Honorable mentions will receive $50 Gift Certificates courtesy of Dover Saddlery. Go to www.wihs.org/Barn-Night now to sign up to be eligible for this year's contests and prizes. Discounted tickets for Barn Night are available at the Verizon Center Group Sales Office. Call (202) 661-5061 now to reserve your seats! The minimum group size is 10 people. Visit www.wihs.org/tickets/ for more information on purchasing tickets to this year’s event. Download the 2012 Official WIHS Prize List at www.wihs.org/prize-list/. 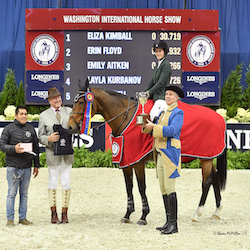 Learn more about the Washington International and the WIHS Regional Horse Show & USHJA Zone 3 Finals at www.wihs.org, join us on Facebook and follow us on Twitter.